There are two lights whereby man is enlightened--the light of the world, and the light of heaven. The light of the world is from the sun; the light of heaven is from the Lord. The light of the world is for the natural or external man, thus for those things which are in hint, and although the things which are therein do not appear to be of this light, they nevertheless are so; for nothing can be comprehended by the natural man except by such things as come forth and appear in the solar world, thus except they have somewhat of form from the light and shade therein. All ideas of time and ideas of space, which are of so much account in the natural man that he cannot think without them, are also of the light of the world. 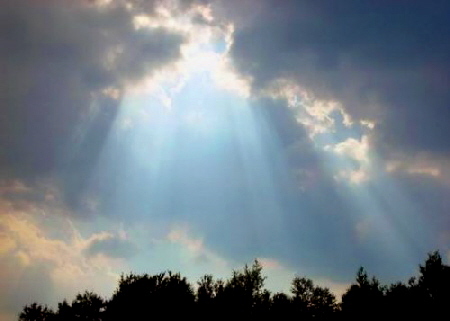 But the light of heaven is for the spiritual or internal man. Man?s interior mind, in which are his intellectual ideas that are called immaterial, is in this light. Man is unaware of this, although he calls his intellect sight, and ascribes light to it; the reason is that so long as he is in worldly and corporeal things he has a perception only of such things as are of the light of the world, but not of such things as are of the light of heaven; the light of heaven is from the Lord alone, and the universal heaven is in this light. It is surprising that man does not as yet know that his intellectual mind is in a certain light that is altogether different from the light of the world; but such is the condition that to those who are in the light of the world the light of heaven is as it were darkness, and to those who are in the light of heaven the light of the world is as it were darkness. This arises principally from the loves, which are the heats of the light. They who are in the loves of self and of the world, thus only in the heat of the light of the world, are affected solely by evils and falsities, and these are the things which extinguish truths, which are of the light of heaven. But they who are in love to the Lord and in love toward the neighbor, thus in spiritual heat, which is of the light of heaven, are affected with goods and truths, which extinguish falsities; but still with these persons there exists a correspondence. Spirits who are only in the things which are of the light of the world, and are thence in falsities derived from evils, have indeed light from heaven in the other life, but such a light as is fatuous, or as that which issues from a lighted coal or firebrand; but on the approach of the light of heaven this light is at once extinguished, and becomes thick darkness. They who are in this light are in phantasies, and the things which they see in phantasies they believe to be truths, nor to them is anything else truth. Their phantasies are also closely bound to filthy and obscene objects, with which they are most especially delighted; thus they think like persons who are insane and delirious. In regard to falsities, they do not reason whether these be so or not, but they instantly affirm them; whereas in regard to goods and truths they carry on a continual ratiocination, which terminates in what is negative. And the light of a lamp shall not shine in thee anymore signifies that they who are in that religious persuasion from doctrine and from a life according to it, have no enlightenment from the Lord, and thence no perception of spiritual truth. By "the light of a lamp" is signified enlightenment from the Lord and thence the perception of spiritual truth; for by "light" is meant the light of heaven, in which the angels are, and men also as to the understanding; which light in its essence is the Divine wisdom; for it proceeds from the Lord as the sun of the spiritual world, which in its substance is the Divine love of the Divine wisdom; from which no other light can proceed than that which is of the Divine wisdom, nor any other heat than that which is of the Divine love. That it is so, is demonstrated in The Angelic Wisdom concerning the Divine Love and Wisdom (n. 83-172). Since that light is from the Lord, and the Lord is omnipresent by it and in it, therefore all enlightenment is effected by it, and thence the perception of spiritual truth, which those have who love Divine truths spiritually, that is, who love truths because they are truths, thus because they are Divine. That this is to love the Lord, is manifest; for the Lord is omnipresent in that light, because the Divine love and the Divine wisdom are not in place, but are where they are received, and according to the reception. That they who are in the Roman Catholic religious persuasion have not any enlightenment, and perception of spiritual truth thence, may be evident from this, that they do not love any spiritual light; for the origin of spiritual light is from the Lord, as was said; and no others can accept that light, nor receive it, but they who are conjoined with the Lord; and conjunction with the Lord is effected solely by the acknowledgment and worship of Him, and at the same time by a life according to His commandments from the Word. The acknowledgment and worship of the Lord, and the reading of the Word, cause the presence of the Lord; but these two together with a life according to His commandments effect conjunction with Him. In Babylon it is the contrary; there the Lord is acknowledged, but without dominion; and the Word is acknowledged, but without the reading of it. Instead of the Lord the pope is there worshiped, and instead of the Word the papal bulls are acknowledged, according to which they live, and not according to the commandments of the Word. And those bulls have for their end the dominion of the pope and his ministers over heaven and the world, and the commandments of the Word have for their end the Lord's dominion over heaven and the world; and these are diametrically opposite to each other, like hell and heaven. These things are said, that it may be known, that they have altogether no light of a lamp, that is, enlightenment, and thence the perception of spiritual truth, who are in the Babylonish religious persuasion from doctrine and from a life according to it. He was the true Light, which enlighteneth every man that cometh into the world (John 1:4-12). This is the judgment, that the Light is come into the world; he that doeth the truth cometh to the Light (John 3:19, 21). Jesus said, Yet a little while is the Light with you; walk while ye have the Light, lest darkness seize upon you; while ye have the Light, believe in the Light, that ye may be sons of the Light (John 12:35, 36). Jesus said, I am come a Light into the world, that everyone who believeth in Me, may not abide in darkness (John 12:46). Jesus said, I am the Light of the world (John 9:5). Simeon said, Mine eyes have seen Thy salvation, a Light for the revelation of the nations (Luke 2:30-32). The people sitting in darkness have seen a great Light; and to them that sit in the region and shadow of death, Light has arisen (Matt. 4:16; Isa. 9:2). I have given thee for a Light of the nations, that thou mayest be My salvation even unto the extremity of the earth (Isa. 49:6). The city New Jerusalem hath no need of the sun and moon to shine in it, for the glory of God enlighteneth it, and the lamp of it is the Lamb (Rev. 21:23; 22:5). Having the glory of God; and her light was like unto a stone most precious, as it were a jasper stone, shining like crystal, signifies that in that church the Word will be understood, because translucent from its spiritual sense. By "the glory of God" is signified the Word in its Divine light, as will be seen presently; by "its light" is signified the Divine truth therein, for this is meant by light in the Word (n. 796, 799); like a stone most precious, like a jasper stone, "shining like crystal," signifies the same shining and translucent from its spiritual sense, of which also in what follows. By these words is described the understanding of the Word with those who are in the doctrine of the New Jerusalem, and in a life according to it. With these the Word shines as it were when it is read; it shines from the Lord by means of the spiritual sense, because the Lord is the Word, and the spiritual sense is in the light of heaven which proceeds from the Lord as a sun, and the light which proceeds from the Lord as a sun, is in its essence the Divine truth of His Divine wisdom. That in every particular of the Word there is a spiritual sense, in which the angels are, and from which their wisdom is derived, and that the Word is translucent from the light of that sense to those who are in genuine truths from the Lord, is shown in The Doctrine of the New Jerusalem concerning the Sacred Scripture. By "Moses and Elias" is there signified the Word; the Lord also then caused Himself to be seen by the disciples as the Word in its glory. That "glory" signifies the Divine truth, may be seen from many passages of the Word above (n. 629).